BRIDGETOWN, Barbados (AP) — A Caribbean-based medical school that temporarily held classes aboard a cruise ship after Hurricane Maria is moving from Dominica to Barbados. Officials said Friday that Ross University School of Medicine sustained millions of dollars in losses after the Category 5 storm hit Dominica last year. Some 1,500 students, faculty and staff will relocate to the Barbadian capital of Bridgetown. U.S. students make up 90 percent of the university's roster. Novelist Jean Rhys is best known for her lyrical masterpiece "Wide Sargasso Sea," in which she gives in an incandescent voice to the woman Charlotte Bronte locked away in an attic in "Jane Eyre." Now Rhys gets a similar revival from Caryl Phillips, whose new novel, "A View of the Empire at Sunset," restores Rhys' voice to the long years she spent adrift with men who preferred her when she did not speak. MIAMI (AP) — The names of four deadly hurricanes that slammed parts of the United States, Central America and the Caribbean last year are being retired. MIAMI (AP) — The small Caribbean island of Dominica is making progress toward recovery after a devastating blow from last year's Hurricane Maria, the country's prime minister said Tuesday. Prime Minister Roosevelt Skerrit said the country has exported the first crops harvested since Maria roared across Dominica as a fierce Category 5 on Sept. 18 and that tourism is recovering with the return of cruise ships and the re-opening of hotels on the mountainous island in the eastern Caribbean. UNITED NATIONS (AP) — Secretary-General Antonio Guterres is heading to the hurricane-battered Caribbean, where he said Wednesday that scientists predict the extreme storms during this year's Atlantic hurricane season "will be the new normal of a warming world." MARYVILLE, Tenn. (AP) — Logan Frazier's lifetime dream of studying to be a doctor became a nightmare when a Category 5 hurricane swept over her medical school on a Caribbean island. Although she was one of the first students evacuated from Ross University School of Medicine on Dominica and returned to Maryville on Sept. 24, the 22-year-old says she can't sleep well until all her friends are off the island. UNITED NATIONS (AP) — The U.N. humanitarian office is launching a $31 million emergency appeal for the hurricane-battered Caribbean island of Dominica which was hit by a category 5 storm on Sept. 18. The U.N. said Friday the appeal aims to provide emergency aid to 65,000 people from September to December 2017. It said $3 million was expected to be released later Friday from the U.N.'s Central Emergency Response Fund for Dominica. The U.S. Defense Department was working around the clock to deliver humanitarian assistance to Puerto Rico and the U.S. Virgin Islands, even as the death toll climbed further across the Caribbean after Hurricane Maria. By Monday afternoon, the confirmed toll from Maria's rampage across the Caribbean had jumped to at least 49 deaths, including 16 dead in Puerto Rico and 27 on the hard-hit island of Dominica. UNITED NATIONS (AP) — Syria's foreign minister told world leaders Saturday that victory against terrorists in his war-ravaged nation "is now within reach" while North Korea's foreign minister said U.S. President Donald Trump's insult to his country makes an attack against the U.S. mainland inevitable. The U.S. National Hurricane Center says Maria has regained its major hurricane status, rising to a Category 3 storm early Thursday. An update from the Miami-based center says maximum sustained winds have increased to near 115 mph (185 kph) with higher gusts. Hurricane Maria kept thrashing Puerto Rico on Wednesday, ripping trees out of the ground and hammering two-thirds of the island with hurricane-force winds. "This is total devastation," said Carlos Mercader, a spokesman for Puerto Rico's governor. "Puerto Rico, in terms of the infrastructure, will not be the same. ... This is something of historic proportions." SAN JUAN, Puerto Rico (AP) — Hurricane Maria barreled toward Puerto Rico on Tuesday night after wreaking widespread devastation on Dominica and leaving the small Caribbean island virtually incommunicado. As rains began to lash Puerto Rico, Gov. Ricardo Rossello warned that Maria could hit "with a force and violence that we haven't seen for several generations." ROSEAU, Dominica (AP) — As Hurricane Maria hammered Dominica with 160 mph (260 kph) winds Monday, Prime Minister Roosevelt Skerrit hunkered down in his official residence and turned to social media to tell of the storm's fury, each post more dire than the previous. Maria's "merciless" winds were turning sheet metal into deadly projectiles and "we dare not look out," Skerrit said on Facebook, praying for the tempest to end. "Rough! Rough! Rough!" 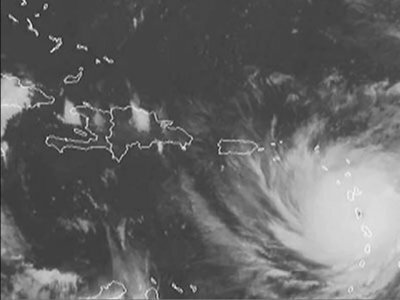 Hurricane Maria has pounded Dominica with "widespread devastation" as it barrels toward St. Croix and threatens catastrophic damage to Puerto Rico. Hurling winds of 160 mph (257 kph), Maria shredded the Dominica Prime Minister's house overnight Monday into Tuesday and left much of the island -- population 73,000 -- in ruins. "Initial reports are of widespread devastation," Dominica Prime Minister Roosevelt Skerrit said on Facebook. The Caribbean island of Dominica has been "devastated" by Hurricane Maria, the country's Prime Minister tells CNN. The powerful storm, which made landfall Monday night, has since been downgraded to a Category 4 with sustained winds of 155 mph. After it passes over Dominica it is on course to score a direct hit on the US territory of Puerto Rico -- the first hurricane of its strength to do so in 85 years. A series of Facebook posts by Dominica Prime Minister Roosevelt Skerrit is capturing the power of Hurricane Maria as it roars past the island as a Category 5 storm. About 8:45 p.m. Skerrit writes: "The winds are merciless! We shall survive by the grace of God!" A few minutes later, he writes that he can hear the sound of galvanized steel roofs coming off houses on the small, rugged island in the eastern Caribbean. ROSEAU, Dominica (AP) — Pakistan won its first test series in the Caribbean after a dramatic end to the third test on Sunday, finally dismissing West Indies for 202 in its second innings with just one over left on day 5. Roston Chase was left stranded on 101 not out as Pakistan won by 101 runs to clinch the three-match series 2-1. ROSEAU, Dominica (AP) — West Indies played cautiously to reach 14-0 at stumps on day 2, still 362 runs behind Pakistan's first-innings total of 376 in the decisive third test on Thursday. Kieran Powell was 9 not out and Kraigg Brathwaite undefeated on 5 at Windsor Park. West Indies faced 11 overs in the final session after Pakistan had resumed on 169-2 overnight and made slow progress throughout the day. ROSEAU, Dominica (AP) — West Indies lined up to form a guard of honor when Younis Khan came out to bat in what could be his last innings for Pakistan on Wednesday as the tourists dominated day 1 of the decisive third test. BRIDGETOWN, Barbados (AP) — Tropical Storm Matthew lashed islands in the eastern Caribbean with heavy wind and rain Wednesday night as it gained strength and headed west into open waters.